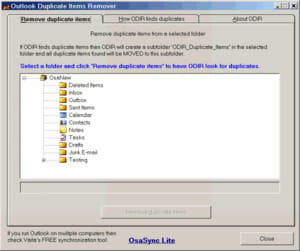 Outlook Duplicate Item Remover (ODIR) is, as its name suggest, a software created to remove duplicated items in Outlook Express. That kind of task can be performed quickly and easily. Detecting: ODIR was mainly created to detect items that are repeated twice or more. This could be, for instance, the contact items such as name or addresses, the appointments items like the subject or the location, or the text itself. Removing: after detecting the duplication, the software proceeds to delete those files rapidly. For that, the user only has to choose the folder where he wants to look for duplicates and click the Remove duplicated items button. Compatibility: the advantage with ODIR is that it is compatible with all version of Outlook except the 2013 one. The user has just to install the software and it automatically works with the Outlook Express already installed on the computer. ODIR is already integrated in Outlook 2010. This is a completely free tool. ODIR is available in Spanish language. It is also able to remove junk emails. The software does not support running in Outlook 2013 and in 64bit Office version. Latest update on February 25, 2015 at 08:08 AM.